Modern technology meets traditional beekeeping: two entrepreneurs from Switzerland have developed a scale that uses the latest sensor-to-cloud technology to detect movement in beehives and makes the data available online. HiveWatch’s new digital scale makes analysing bee colonies and their movements considerably easier. Iftest has been involved since the early stages of development and remains, to this day, an important partner in the further development and market launch of this innovative product. A population census gives the government an insight into the country’s population size, and from this data it can draw conclusions about the current state of society. The same applies to bee colonies. Although some bee colonies are only a few metres away from each other, they can differ greatly. In order to get a clearer picture of this diversity and the condition of bee colonies, Silvio Ziegler and Jens Deicher founded HiveWatch in 2015. The original idea came from Silvio Ziegler’s mother. The beekeeper was looking for a way to detect bee swarms and reduce colony losses. Inspired by this common problem faced by beekeepers, Silvio Ziegler and Jens Deicher developed a swarm detector based on a precision scale. It quickly became clear to both inventors that a comprehensive picture of a beehive’s health could only be achieved via continuous weighing. Intelligent algorithms enable instant data analysis, which makes a beekeeper’s daily life much easier. Calculation of the data analytics is carried out by the integrated Iftest electronics. The electronics also ensures that the innovative beehive scale is not only intelligent, but also financially viable. HiveWatch realised that the Internet of Things can provide benefits for a wide variety of applications. Thanks to modern technology, data collected about the bees can be viewed online and analysed for research purposes, as the intelligent system collects data which can be used for many different applications. For example, by analysing the data, estimations can be made about bee populations, honey production per region and feed consumption or reserves. Furthermore, conclusions can be drawn about the influence of pollutants on the health of the bee colonies. Thanks to Big Data, we can gain a better understanding of bees in a much wider context and raise the public’s awareness of sustainability issues. This makes HiveWatch an important analysis tool when examining the somewhat dramatic bee deaths of the last few years and the influence of climate change or genetically modified plants on these small but essential pollinators. Iftest’s high-tech electronics form the core of the digital scale. 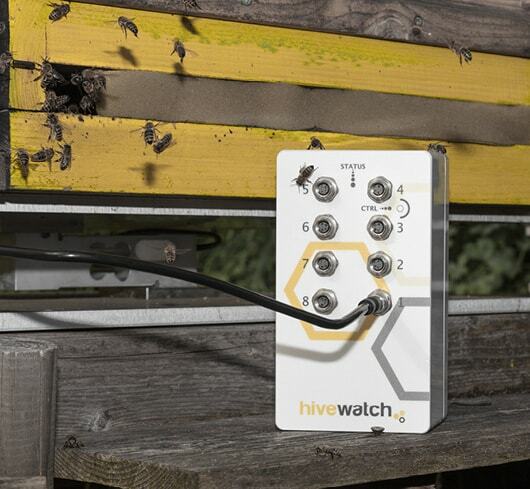 The electronics company from Wettingen, Switzerland, has been involved with HiveWatch since the beginning of its development and has supported HiveWatch by quickly delivering prototypes. When working together, HiveWatch’s feedback was immediately integrated into the product’s development, leading to an efficient market launch. Iftest benefits from the full integration of development, fast prototyping, industrialisation, and series production at one site. To date, around 550 HiveWatch scales have been sold worldwide, mostly in Switzerland. A few ‘Made in Switzerland’ beehive scales were also sold in New Zealand and Chile. HiveWatch also wants to gain a foothold in other countries and will continue to rely on Iftest’s hightech electronics in the future.